Who To Hate More: The Morally Repugnant, or the Morally Bankrupt? It is rare that I look at a lawsuit and think that personal injury lawyers make any contribution to society. From the lady that spilled McDonald's coffee on her punani to the ridiculous pantsless (now former) D.C. judge, most people have begun to roll their eyes at a certain type of lawyer and the clients that feed them. But, today, maybe I don't hate them quite so much, because one of their ilk managed to convince a judge and jury to (potentially) bankrupt the Westboro Baptist Church. Let the vitriol roll, after the jump. 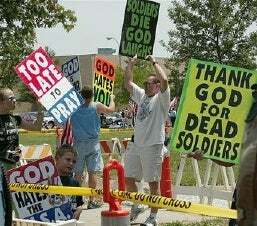 The Westboro Baptist Church is a bunch of crazy-eyed lunatics that blame teh gays for the War in Iraq, probably because someone beat them to blaming the Jews. Their "reasoning," as far as I can follow with my rationality-addled brain, is that because the government allows gay people to exist, God is punishing us by allowing Iraqi bullets and IEDs to kill our troops. To hammer this point home, they travel around the country holding protests (most at the funerals of soldiers killed in Iraq) and holding signs at least as offensive as the ones in the picture. Also, please note the presence of a child in the picture. Protesting homosexuality is a family affair for these sick fucks. Well, last year, they apparently protested the wrong damn funeral. Lance Cpl. Matthew Snyder's dad, Albert, decided to sue their pants off for disrupting the funeral of his son. Yesterday, in what some have called a victory for hurt feelings over free speech, the judge and jury awarded Albert Snyder $2.9 million in compensatory damages, $6 million in punitive damages and $2 million for emotional distress — an amount that is reportedly far more than the assets of the church or its leaders. So, on the one hand, good for the Snyder family to sticking to these assholes that make my skin crawl with revulsion. Even if the award gets reduced or the verdict thrown out during the inevitable appeal, they've hopefully caused them enough financial damage to limit the number of other people's funerals they can protest at this year (though, that's probably wishful thinking, as I'm sure this will be great for their fundraising efforts). On the other hand, it's causing me to praise lawyers for using our legal system to get a man $11 million for what was probably a legal (if incredibly offensive) protest, and the lawyer who is probably helping erode my free speech rights is going to pocket something in the range of $5.5 million for himself. It's so hard to choose sometimes between the incredible satisfaction of legal vengeance and the fact that getting that vengeance probably hurts my rights more in the long run.